Unitas was chosen in the 9th round of the 1955 NFL draft by the Steelers, but failed to make the team in the preseason. After playing semi-pro football, he was signed by the Colts to back up starting QB George Shaw and when Shaw went down with a broken kneecap four games into the ’56 season, Unitas got his chance, showed potential, and held onto the job. He broke out in 1957, leading the league in pass attempts (301), yards (2550), TD passes (24), and yards per attempt (8.5). 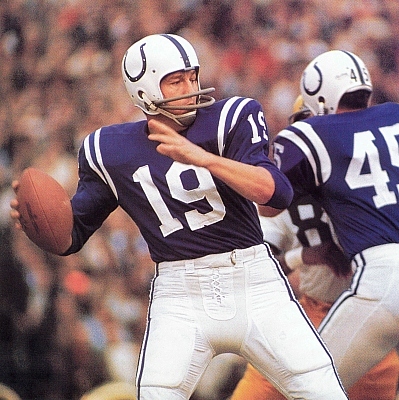 The Colts contended and Unitas was selected to the Pro Bowl and received MVP consideration. It set the stage for a championship season in ’58, with Unitas leading the NFL with 19 TD passes despite missing two games due to injury and then leading the Colts to a title with a memorable overtime win over the Giants. Unitas was chosen to a second Pro Bowl and was a consensus first-team All-Pro for the first time. An outstanding play-caller as well as passer with a quick release, he was adept at throwing long, short, or in between. He followed up in 1959 by leading the NFL in pass attempts (367), completions (193), yards (2899), and a then-record 32 touchdown passes. The Colts repeated as league champs and Unitas received MVP as well as All-NFL and Pro Bowl recognition. He continued to excel, although the Colts went into a brief decline. His record 47-straight-game TD passing streak ended in 1960 (and remained the standard until 2012) and he led the NFL in passing attempts, completions, and yards twice more and TD passes once through 1963, by which point he had achieved seven straight Pro Bowl selections. The Colts went 12-2 to finish first in the Western Conference while leading the NFL in total yards (4779), scoring (428 points), and touchdowns (54). Lost NFL Championship to Cleveland Browns (27-0). Unitas was having another outstanding season in 1965 until felled by a knee injury, still garnering consensus first-team All-NFL honors. He was chosen for the Pro Bowl following the 1966 and ’67 seasons, the latter of which saw him gain MVP honors for the fourth (and last) time. A severe elbow injury caused him to miss virtually all of the 1968 season and he showed wear over the remainder of his 18-year career that ended with the Chargers in 1973, although he quarterbacked the Colts through one last championship season in 1970. For his career, Unitas set then-NFL standards for pass attempts (5186), completions (2830), yards (40,239) and touchdowns (290). He was named to 10 Pro Bowls and received first- or second-team All-NFL honors eight times. Unitas had his #19 retired by the Colts and was inducted into the Pro Football Hall of Fame, Class of 1979.